LAKE SHASTA - Howard Hughes just found out he had the fishing trip of his 6O-year life. 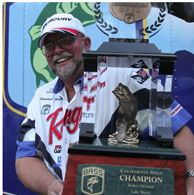 The public address announcer proclaimed the Redding angler champion of the CITGO Bassmaster Western Open: Lake Shasta on Saturday. The crowd applauded as Hughes' three-day limit of 15 fish weighed a total of 31 pounds, 6 ounces. When the cheering was over, Hughes headed off the stage until the announcer asked, "Do you want to take the trophy?" Then one-upped it by asking, "Howard, can I have the boat?" Not unless he has $30,000, which is about what the new fishing boat costs. Hughes also took in about $20,000 in prize money. The real deal though is the massive trophy Hughes cherished. "I've wanted to win this for a while," Hughes said of the trophy. "Greg Gutierrez and Russ Meyer are friends of mine, and they've won one." Gutierrez, the defending Western Open: Lake Shasta champion from Red Bluff, took 17th with a total of 23 pounds, 12 ounces. Meyer, the 2005 Western Open: California Delta Waterway champ from Redding, didn't do as well, missing the 35-man cut to get into Day 3. Hughes' ascent to the top first took him from 25th place to second place on Day 2. So, did he keep the same strategy for the final climb? "Absolutely," Hughes said "I had a great afternoon bite in one area, and I didn't really know it was such a good morning bite until today. "I just trashed it today. I wasn't going to move, just catch everything I could catch." And, it wasn't even a pro-fishermen-only-know spot, either. "It's very popular," a surprised Hughes said. "I was in the Pit River, where everybody knows - just blew me away. "I used a six-inch, shad-pattern worm, and I was shaking. "The shaking helped Hughes top Fred Roumbanis of Auburn, who was trying to win the tournament wire to wire, by 15 ounces. Roumbanis began the day with a lead over Hughes. Starting Saturday in fifth place - 3 pounds, 6 ounces back - Mark Schroeder of Red Bluff went out on the lake with a sense of urgency to snag the fish that might get him the title. "I was trying to cover a lot of water and finally caught a 3-pounder at about 2 o'clock, which really helped out a lot" Schroeder said of the spotted bass he get on a Vixen topwater bait. "I caught several of myflsh on a 1/2-ounce, brown-on-brown jig, and I was able to get good topwater fish each day." Schroeder took 7-pounds, 13-ounces worth of fish to the final weigh-in, giving him a total of 26 pounds, 15 ounces for sixth place. David Russell of Cottonwood finished eighth at 24 pounds, 10 ounces; and Jim Riley of Shasta Lake was 10th at 24 pounds, 8 ounces. Redding's Mike Gray (24th), Charles Keller (28th) and Bill Townsend (31st), and Anderson's Pat Clement (32nd) finished in the money. In the non-boater division, Anderson's Jonas Lowry was second in the Big Bass competition with a a 2 pound, 12-ounce catch on Day 2. He used that to help him move from 45th after the first day up tosixth by the conclusion. set back into the lake. "This is not killing, this is a renewal sport," Gutierrez said in appreciation of the bass. "It's all about having them out there so we can do this." For the fishing. For the memories. "The most important victory in my career," Hughes said. "The dream has happened."